Bill Merry grew up around the law and understood the seriousness of the calling at a young age. His father was an attorney and municipal judge for over 30 years. While in high school, Bill would spend summers filling in for the court bailiff, serving papers and sitting in on hearings, and observing the profession in more detail. By the time he reached college, he was anything but certain that the practice of law was his destiny. Between semesters, while at Miami University, he worked with his hands digging ditches and loved being outdoors. Still, the promise of intellectual challenge and variety would eventually lure him into law school at Ohio State. The rest is history. Bill has served generations of families in Southeastern Ohio. 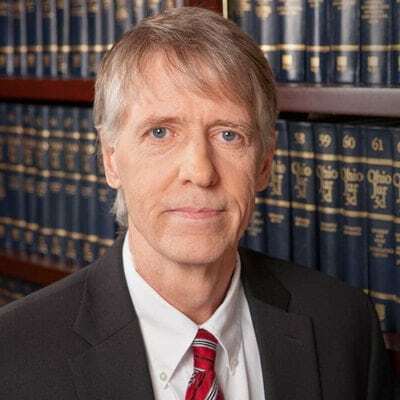 In addition to Bill’s “brains,” his commitment to expert legal craftsmanship defines his successful legal career of nearly 40 years, guiding individuals and companies in legal matters related to real estate, business, banking, collections, bankruptcy, and more. He says he is fortunate to have learned quite a bit over the years and that his clients are the beneficiaries of his wide-ranging experience. Bill says that having satisfied clients is the most rewarding aspect of his career. Whether the work involves taking a flawed deal and turning it around into something successful or talking a client out of a decision that would result in undesirable consequences, Bill focuses on helping people get through essential transactions—both business and personal. Bill also tells people that he’s one of those attorneys that help people in the present so that they don’t need an attorney in the future. Over the years, Bill has helped family farmers keep the farm, small business people thrive, and homeowners avoid foreclosure. He has assisted a local water authority in acquiring additional property to secure needed water supply and protect the watershed from a very corrupt out-of-state business that was involved in multiple criminal and bankruptcy proceedings. Today, Bill mostly handles real estate deals, deeds, purchase contracts, and easements. He also helps people form business entities, reviews or drafts their contracts and represents banks in title work, collections, foreclosures, and bankruptcies. Many of his clients have known and trusted him with their essential or complex legal needs for many years. They find him very approachable and easy to talk to. They relate to Bill because he’s a straight-talker.